Should I read It: Absolutely! 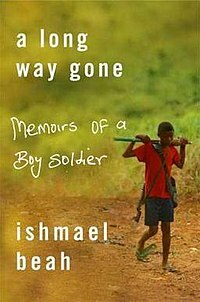 A Long Way Gone: Memoirs of a Boy Soldier, leaves behind the distant jargon of discourse surrounding war, and in a gorgeously frank voice shows us the humanity such discourse avoids. When we hear about rebels taking over a city, women raped before their families, suicide bombers in crowded marketplaces, and focus on the violence, we catalogue it as ‘news’ but never engage with the emotions, the people, the humanity lost, found, and altered within such violence. Memoirs of a Boy Soldier isn’t just about war, it’s more than a coming of age story in a desperate situation, it’s a tender vice that slowly expands reader’s understanding of how much humanity is. A Long Way Gone shows that in spite of all the pain and horrors humanity can inflict and accommodate, the lengths the human spirit will go to hold us together, to reach out to other people, and find in our hearts, new spaces to call home. Beah notes, “If there is nothing good left in the destiny of a person, he or she will die” (54). A Long Way Gone is evidence that perhaps there is always good lying ahead, and the human spirit is capable of fighting very hard to get there. Check out our interview with Ishmael Beah here.